The syllabus prescribed by UGC-CSIR and UGC-NET for paper-I and Paper-II without negative marks will be adopted for APSET. The Paper II & III are combined together to become Paper-II. The APSET exam is conducted for recruitment and promotions of Lectures or Assistant Professors in Degree Colleges as per the University Grant Commission Regulations (UGC) for the year 2018. 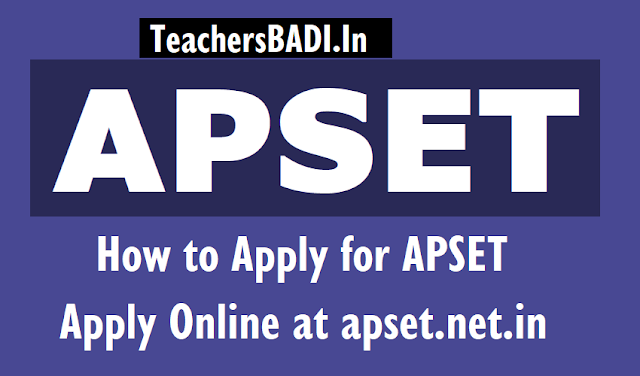 APSET 2018 will be held in Visakhapatnam, Rajamundry, Guntur, Nellore, Ananthapur, and Thirupati. The last date to apply for the APSET exam is May 2. The state level eligibility test (AP SET) will be held on July 1st, 2018, according to Set Secretary Secretary. A total of 31 subjects will have an AP SET examination. Hall tickets can be downloaded online. The relevant candidates will have to write 2 papers like UGC NET. The first test will be from 9.30 am to 10.45 pm, the second test will be held from 11.15 pm to 12.30 pm. Test centers were set up in six major cities across the state. Aadhaar card, PAN card and driving license should be brought along with one of the candidates. Just a minute break. All PWD Candidates have to attend certificate verification on 12-11-2018 at 10 A.M. The exam will comprise of two papers: Paper 1 will consist of 50 objective type questions to test reasoning ability, comprehension, divergent thinking and general awareness of the candidate; Paper 2 will carry 100 subject specific objective questions. APSET-2018 Applications should be submitted through online mode only. The Registration fee for online submission and late fee, if applicable may be paid through payment gateway(Credit card/ Debit card/ Net Banking).